One of the exercises I set myself while visiting NCAR this month is to try porting the climate model CESM1 to my laptop (a MacBook Pro). Partly because I wanted to understand what makes it tick, and partly because I thought it would be neat to be able to run it anywhere. At first I thought the idea was crazy – these things are designed to be run on big supercomputers. But CESM is also intended to be portable, as part of a mission to support a broader community of model users. So, porting it to my laptop is a simple proof of concept test – if it ports easily, that’s a good sign that the code is robust. It took me several days of effort to complete the port, but most of that time was spent on two things that have very little to do with the model itself. The first was a compiler bug that I tripped over (yeah, yeah, blame the compiler, right?) and the second was the issue of getting all the necessary third party packages installed. But in the end I was successful. I’ve just completed two very basic test runs of the model. The first is what’s known as an ‘X’ component set, in which all the major components (atmosphere, ocean, land, ice, etc) don’t actually do anything – this just tests that the framework code builds and runs. The second is an “A” compset at a low resolution, in which all the components are static data models (this ran for five days of simulation time in about 1.5 minutes). If I was going on to test the port correctly, there’s a whole sequence of port validation tests that I ought to perform, for example to check that my runs are consistent with the benchmark runs, that I can stop and restart the model from the data files, that I get the same results in different model configurations, etc. And then eventually there’s the scientific validation tests – checks that the simulated climate in my ported model is realistic. In addition to the model itself, there are another 12,000 lines of perl and shell script that handle the installing, configuring, building and running the model. The compiler. I decided to use the gnu compiler package (gfortran, included in the gcc package), because it’s free. But it’s not one of the compilers that’s supported for CESM, because in general CESM is used with commercial compilers (e.g. IBM’s) on the supercomputers. I grabbed the newest version of gcc that I could find a pre-built Mac binary for (v4.3.0), but it turned out not to be new enough – I spent a few hours diagnosing what turned out to be a (previously undiscovered?) bug in gfortran v4.3.0 that’s fixed in newer versions (I switched to v4.4.1). And then there’s a whole bunch of compiler flags (mainly to do with compatibility for certain architectures and language versions) that are not compatible with the commercial compilers, which I needed to track down. Third party packages such as MPI (the message passing interface used for exchanging data between model components) and NetCDF (the data formating standard used for geoscience data). It turns out that the Mac already has MPI installed, but without Fortran and Parallel IO support, so I had to rebuild it. And it took me a few rebuilds to get both these packages installed with all the right options. Once I’d got these sorted, and figured out which compiler flags I needed, the build went pretty smoothly, and I’ve had no problems so far running it. Which leads me to draw a number of (tentative) conclusions about portability. First, CESM is a little unusual compared to most climate models, because it is intended as a community effort, and hence portability is a high priority. It has already been ported to around 30 different platforms, including a variety IBM and Cray supercomputers, and various Linux clusters. Just the process of running the code through many different compilers shakes out not just portability issues, but good coding practices too, as different compilers tend to be picky about different language constructs. Second, in the process of building the model, it’s quite easy to see that it consists of a number of distinct components, written by different communities, to different coding standards. Most obviously, CESM itself is built from five different component models (atmosphere, ocean, sea ice, land ice, land surface), along with a coupler that allows them to interact. There’s a tension between the needs of scientists who develop code just for a particular component model (run as a standalone model) versus scientists who want to use a fully coupled model. These communities overlap, but not completely, and coordinating the different needs takes considerable effort. Sometimes code that makes sense in a standalone module will break the coupling scheme. Scientific code – the bulk of the Fortran code in the component modules. This includes the core numerical routines, radiation schemes, physics parameterizations, and so on. This code is largely written by domain experts (scientists), for whom scientific validity is the over-riding concern (and hence they tend to under-estimate the importance of portability, readability, maintainability, etc). Infrastructure code – including the coupler that allows the components to interact, the shared data handling routines, and a number of shared libraries. Most of this I could characterize as a modeling framework – it provides an overall architecture for a coupled model, and calls the scientific code as and when needed. This code is written jointly by the software engineering team and the various scientific groups. Installation code – including configuration and build scripts. These are distinct from the model itself, but intended to provide flexibility to the community to handle a huge variety of target architectures and model configurations. These are written exclusively by the software engineering team (I think! ), and tend to suffer from a serious time crunch: making this code clean and maintainable is difficult, given the need to get a complex and ever-changing model working in reasonable time. In an earlier post, I described the rapid growth of complexity in earth system models as a major headache. This growth of complexity can be seen in all three types of software, but the complexity growth is compounded in the latter two: modeling frameworks need to support a growing diversity of earth system component models, which then leads to exponential growth in the number of possible model configurations that the build scripts have to deal with. Handling the growing complexity of the installation code is likely to be one of the biggest software challenges for the earth system modeling community in the next few years. Interesting post, Steve! Does CESM use commercial compilers due to better performance in supercomputing environments? In your observations about scientific code, you write “scientific validity is the over-riding concern (and hence they tend to under-estimate the importance of portability, readability, maintainability, etc).” If scientific validity is the scientist’s equivalent to the software developer’s program correctness, should this rightfully not be the overriding concern? It doesn’t seem like their emphasis on scientific validity is what detracts from portability and all those good things — intuitively, they feel like separate concerns. Perhaps it is the scientists’ desire to move on to the next task that steers them away from these software quality issues. We probably shouldn’t be complaining about lack of documentation, portability, etc. (and I think you’re just making observations here, not complaining); after all, we’re trying to spur people into action, not have them sit around and design by committee! My impression of this community is that if something needs fixing, you go to the source, if possible. If something doesn’t need fixing for a while, perhaps it isn’t broken. I wonder if the quality of the code has evolved to require the minimum amount of effort of the programmer to maintain (that is, minimizing the total cost of communicating with others after writing code and writing the code in the first place). NASA has an effort (the Climate-in-a-Box) to simplify the process of getting up in running for scientists by providing hardware pre-packaged with modeling codes and frameworks. I believe the idea is that scientists could 1) not have to mess with a complex installation for their personal use; and 2) be able to run low-resolution scenarios to help determine what is worth submitting for high-res runs on a supercomputer. The Climate-in-a-Box uses a small Cray machine; the next step in accessibility may be to provide more conventional installers for Mac and Windows. Very cool to hear of your success! I had poked some last month at getting ccsm running on my Ubuntu vm. Ran into architecture specific makefile issues seemingly similar to what you described. I moved on for now but hope to return to the project. Any chance you can post your changes/makefiles? As to the ‘debate’, it will have minimal impact. The argument against the models have more to do with lack of validation over time, complexity, “ignores everything except CO2”, and “tuning” of key parameters. I doubt that having a cadre of amateurs running their own versions of climate models will have much impact on those kind of critiques/fallacies. What might be more fruitful is that amateur cadre may pursue interesting project ‘experiments’ or educational demos for which the big shops might not have the time or inclination. I wasn’t sure whether anyone would want the gory details, but here’s my detailed notes from the port. 0) Platform: A MacBook Pro laptop. I’m running Leopard, Mac OS X version 10.5.8, on an intel core duo. A GOTCHA: I originally downloaded a gfortran binary from http://www.macresearch.org/gfortran-leopard, This gave me gfortran v4.3.0, which turns out to have a bug in how it handles the symbol table for fortran modules, which shows up when compiling mct/mpeu. This specific bug wasn’t reported anywhere in the gfortran bug database (so I reported it), but is fixed anyway in the latest version, 4.4.1. Hence, I’d recommend building the latest version of gcc from the sources, rather than relying on an older binary. You have to register as an apple developer, but it’s free. Incidentally, I never found out why I need the developer tools, so I don’t know what the dependencies are. 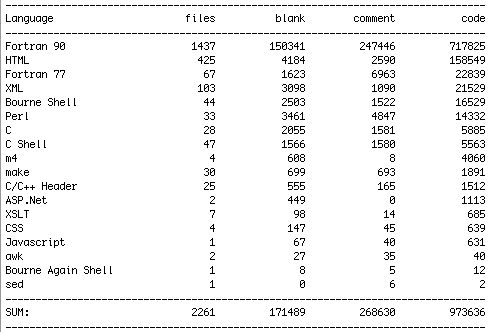 I decided not to use the binaries, as the CESM docs suggest MPI should be compiled with the same compiler as CESM. So I downloaded the source, and built it myself. …including the recommendation *not* to replace the pre-installed version. Too late for me – I hope I didn’t break anything! This in turn needs SZIP (source code available from the same place). Another GOTCHA: I had great difficulty getting NetCDF to build, as it kept complaining about not finding HDF5. Eventually I just used the pre-compiled binaries available from the link above. 5) libcurl. This isn’t installed on the Mac, and is needed to build the libraries in csm_share. 6) Okay, now ready to install CESM. In particular, some of the tips in Appendix E aren’t in the user guide. Particularly the bit about MCT and PIO using their own build systems, so they don’t pick up the regular compiler flags. It took me a while to figure out that I needed to insert their compiler flags in the CONFIG_ARGS variable. There’s probably a cleaner way to do this, via the PIO_CONFIG_OPTIONS, but it works for now. …and after all that, it built successfully. a) getting MPI and NetCDF installed and built correctly (with all the correct options). I ended up building each of them several times over with different options until I had everything in place. b) diagnosing the compiler error in gfortran 4.3.0 (If only I’d started with the latest release!!). However, I did find out that the gfortran compiler team are remarkably responsive to bug reports. I had several replies to my bug report within a few hours! They never did find out what caused the problem, but closed the report because v4.4.1 worked fine. c) figuring out all the compiler and linker flags to get pio and csm_share to build correctly. There’s a line in the tutorial notes that says most of the problems are likely to be found trying to build MCT and PIO. I agree! 8) POSTSCRIPT: Sometime during this process, I appear to have completely broken all the Microsoft Office applications (Word, Excel, Powerpoint…). They now all crash immediately on launch. I’ve no idea if this was something I did during installation (perhaps when I blew away the pre-installed MPI??). Or it might be completely unrelated. The only advice I can find on the web about how to fix this is to completely re-install MS Office from the disks. Well, this has finally persuaded me to switch to OpenOffice instead, and I’m loving it so far. How’s that for an unexpected side effect? Fascinating. I might give this a go on FreeBSD some time in the next couple of months. Presumably all the various glue scripts (e.g. in different shells, and in awk, sed, m4, and Perl) just grew like that? A decent process would pick a glue language (or possibly 2) and stick with it. You might start disliking OpenOffice when you fill out IRB forms… but that’s what the CSLab apps servers are for! Isn’t the HTML figure more for documentation than ‘code’? In that case I would be careful about making “faults per LOC” calculations based on the 1 million figure. Do you have any good idea about separating code that is for ‘portability’ reasons (e.g. flags, IFDEFs, makefiles) as opposed to scientific ones? It would be interesting to do some type of aspect-oriented analysis using automated machine learners. Gah! Tell me about it… and in the process of trying to get NetCDF to build, I think I may have broken something such that the pre-compiled binaries didn’t work for me either. (though maybe I will try again with your paragraph as a guide). What I’m most curious about is whether you got any help from the NCAR folks on this or had to sort it all out yourself. I hitted the following commands, and tested the MPI with the Example program from wikipedia http://en.wikipedia.org/wiki/Message_Passing_Interface, to make sure MPI is running. However, the program is running for a long time without producing file in $RUNDIR? Why? Thanks for your help. Hi Steve! At the moment I also try to build cesm on my laptop, a dell with Ubuntu 10.10 as OS. Your post has been extremely useful to me, as I had a lot of similar problems. Finally, I got most of the modelling building well, apart from the the following issue, that appears during the build of lnd. If you would have any ideas, please let me know! I porting cesm1.0 on the supercomputer,I used the default infilter compilers flags, default netCDF-4.1.1 and so on expect the mpi, I installed the mpich2-1.2.1p1 on the machine. But I don’t know how to setting flags,but I successfully built case on this machine and could submit. The result is not ideal. It stops and I don’t know why. If the flags influence it run? Thank you very much! Any help is greatly appreciated….. I can’t download the data files , I have used the check_data_files script but no data is downloaded.